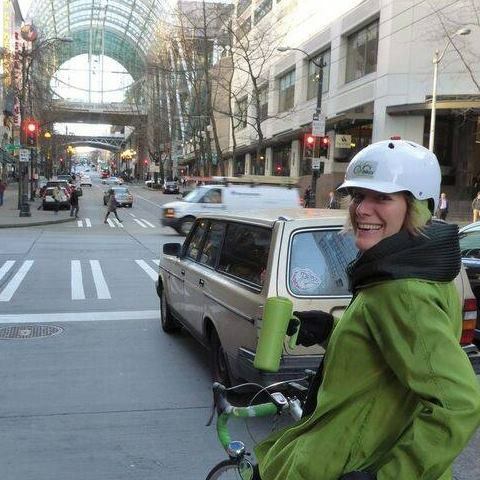 Someone I rode with for part of one morning's commute snapped this pic of me in downtown Seattle traffic, coffee mug in hand while we waited for the light to change. It was all downhill and then a flat bit to get to the office, I lived 3.5 miles from work at the time, and most meetings I needed to get to were within a mile or two — 5-10 minutes by bike. I lived on a bus line, a specific choice I made buying that house so I wouldn’t be socially engineered into driving everywhere by lack of transit service. In other words, I already had one foot out my car door in search of a better way to get around — better for my health, the environment, and my wallet. I wanted new habits. 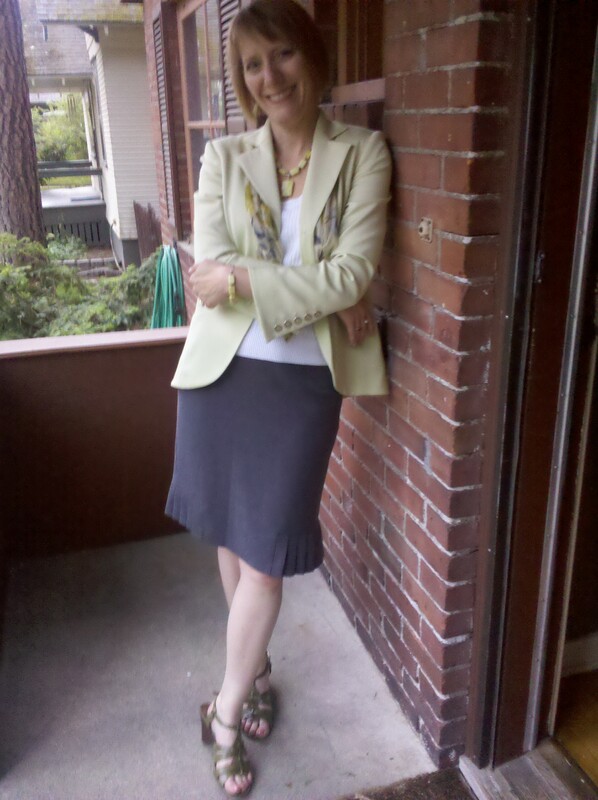 My special clothes for bike commuting when I lived in Spokane. I’m much more comfortable now with a wide range of weather conditions than I was back then and I own the few items that add to bicycling (or walking) comfort when you’re creating your own wind chill. I no longer believe you need to wear special clothing or shoes to ride a bicycle. I have what I need to carry stuff on my bike — nothing more complicated than a rack and a bag or two. As a bonus I’ve realized that using a car allowed me to build up quite the deadweight of things I didn’t really need to carry. I realize how much easier it is to get around on a bike than in a car in downtown traffic — something I started to pick up on as soon as I realized that when I biked to a meeting, I was inside and sitting down while others prowled (and paid) for parking spots close to the door to cut down on all that exhausting walking. I shifted my clothes shopping habits only slightly, to make sure my skirts let me get on the bike and my pant legs don’t get caught in the chain. Shoes? You can bike in anything. It’s easier to bike in high heels than it is to walk in them. My special bike clothing for commuting in Seattle. I got everything in my life lined up to eliminate barriers to biking, which, coincidentally or not (I’m thinking not), meant I started to notice barriers to driving that before I had taken for granted. In short, I developed new habits that make biking, rather than driving, the easy choice. And while I don’t recommend biking on autopilot (mindlessness: the bane of everyone maneuvering in traffic), with those habits I’ve made it oh so easy to get on my bike without even thinking about how I’m going to get to work. It required a lot more thought when I was choosing between biking and driving. By thought, that is, I mean hassle factor. Ready to roll via Amtrak. Train + bike travel is just wonderful. 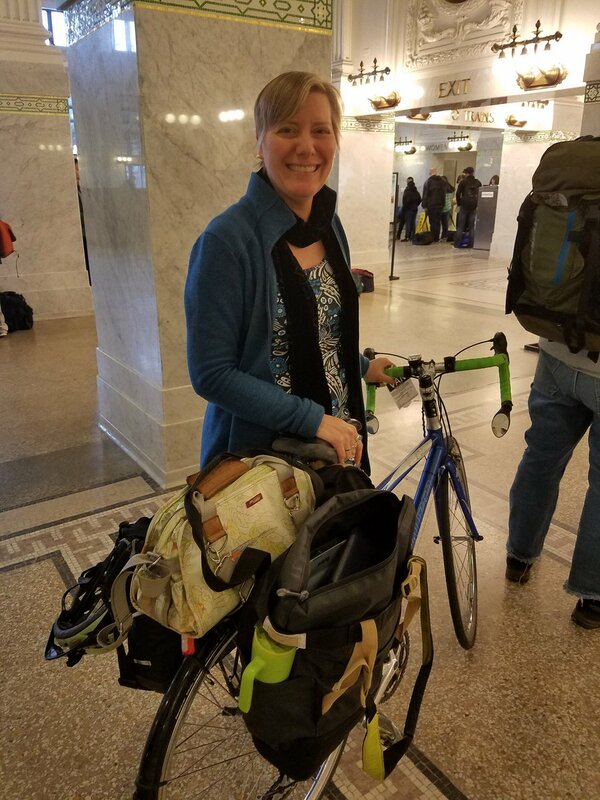 My work life is a little more complicated than it was when I could bike to work five days a week — some days I need to travel 60 miles south or across the state. Nonetheless, I still have the reflexes developed through long repetition of not picking up car keys when I leave the house. 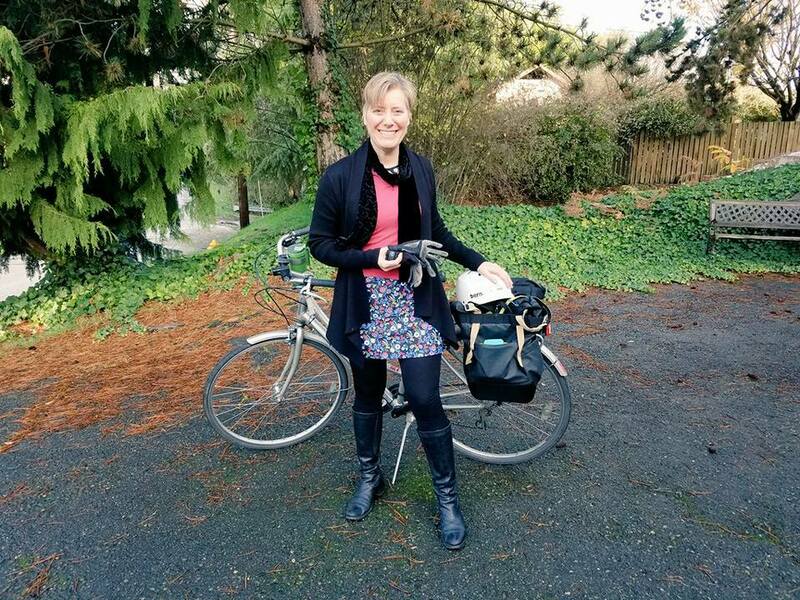 When I travel I take my bike with me to use for any trips away from the office, and if I stay overnight in Olympia (which I sometimes do for a couple of days of back-to-back meetings) I leave the car in the office parking garage and bike back and forth to my overnight hosts. If I need to go farther afield, say to Bellingham or Mount Vernon or Vancouver, I put my bike on the train. I have a folding bike I can check as luggage if I’m flying somewhere. Any of these choices frees me, which is really the point of (good) habits. You don’t need willpower if you’ve formed habits. My slightly more casual “Team Nuu-Muu” look. Either way I’ve had a space and time that are just mine before plunging into the whirlwind and I’ll have another space and time on the way home to shift my mental gears, along with exercise for body and mind. I believe those are the habits the Surgeon General recommends. *By the way — if you’re really a creature of habit and you really like predictable schedules, I have to tell you that going by bike and/or bus gives me a much more predictable commute than driving. Driving involves too many uncontrolled variables: behaviors and decisions of other people, the volume of road space consumed by their vehicles, and the collisions they cause that can trap everyone else in those steel boxes. This was just as true when I lived in Spokane as it is now living in Seattle, so it’s not only a thing in a major metropolitan area. It’s true, though, that the location of my office in Pioneer Square near Safeco Field guarantees me a lot of additional car traffic on certain nights. I smile as I bike past all those people who, for some strange reason, believed they would find car parking near the game. Someone I rode with for part of one morning’s commute snapped this pic of me in downtown Seattle traffic, coffee mug in hand while we waited for the light to change. Have you made bicycling a habit? 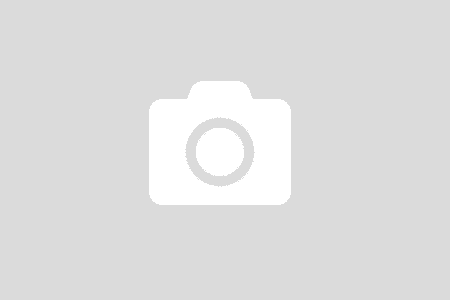 What hassles do you remember most distinctly in the early days that you would tell a new rider not to worry about? 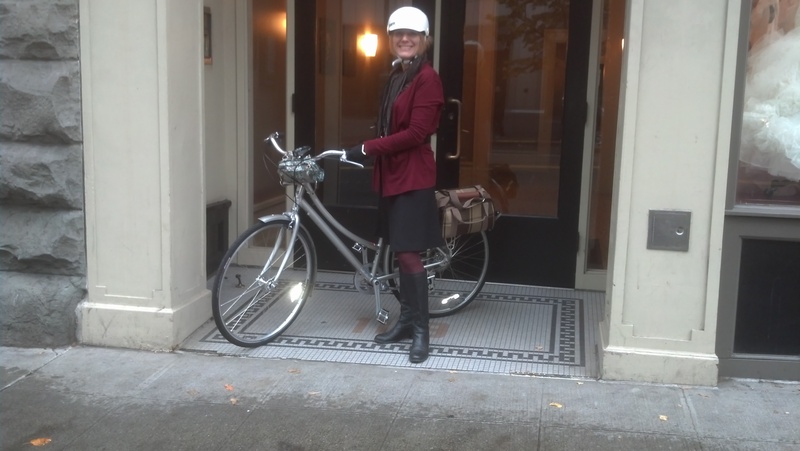 A version of this post first appeared on the Washington Bikes blog while I served as executive director. Updated and used with their permission.